3 Garnets & 2 Sapphires: It's Time For Holiday Portraits & Choosing Our Christmas Cards! It's Time For Holiday Portraits & Choosing Our Christmas Cards! Ever since our oldest was born, we have been sending either Christmas cards with a photo tucked inside or holiday photo cards to our friends and family. After six years, we think we have perfected this undertaking. 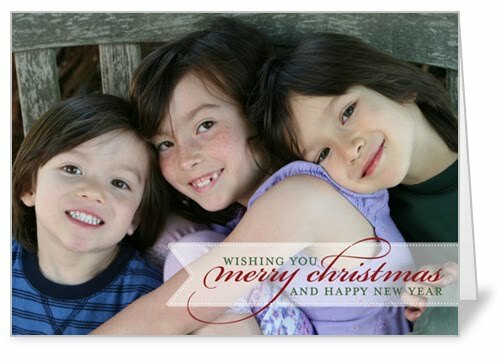 I have found that it is easiest to take a portrait of just our three children myself at home and to have my favorite photo printed professionally on personalized cards. I always have a holiday greeting from our family printed on our cards, so all I need to do is address and stamp the envelopes. I even try to have the envelopes preprinted with our return address when possible. A great photo is one of the key factors to having the perfect holiday cards. This year, I let our 3-1/2 year old daughter choose her own outfit to wear for the portrait. I am so relieved that she chose an adorable top and a charming headband to wear in her hair. The two boys will be wearing matching polos. I am so excited to see how our portraits will turn out. You never know what you will get from my three. Will I end up using a traditional portrait or choosing a less formal candid shot instead? The other key factor is to choose a holiday card that compliments your photo and your personality. 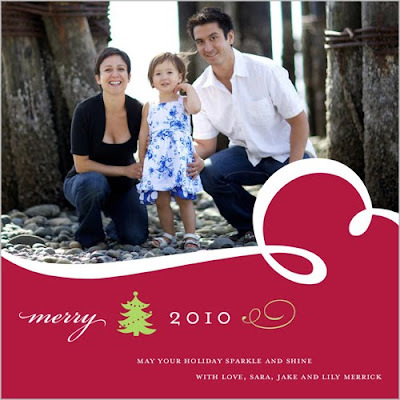 I like the Merry Merry Swirl Christmas card above because of the asymmetrical design. I also love that it is square, which makes it stand out from the traditional 5x7 or elongated rectangular cards. Also, red is my favorite color! I have looked at quite a few card designs with a 3-photo layout. I like the idea of having a spot to highlight each child, but I do not think I could ever leave out a photo of all three of our children together. It is the togetherness that makes a sibling holiday card great. 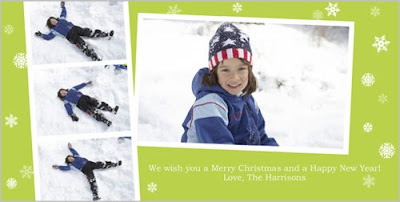 I think the above Sparkling Lime Snowflakes Christmas photo card is a wonderful compromise. It would allow me to show the children together and then still show off each individual child's personality. I have been seeing a lot of lime and red the past few years during Christmas and the idea of it is growing on me. The above Ribbon Wishes Christmas card is simple and I like how the layout does not take the focus away from the photo. The sheer ribbon makes this card stand out apart from the usual cards with a banner added into the design. I think this particular card would work with almost any landscape photo I end up with. Of course, I will not know which of these card designs I will go with until I hold a mini photo shoot and decide on the best group photo. Hopefully, I will get this done within the next few days. I am so excited that Christmas is only 8 weeks away! This post is part of a series sponsored by Shutterfly. I was selected for this sponsorship by the Clever Girls Collective, which endorses Blog With Integrity, as I do. 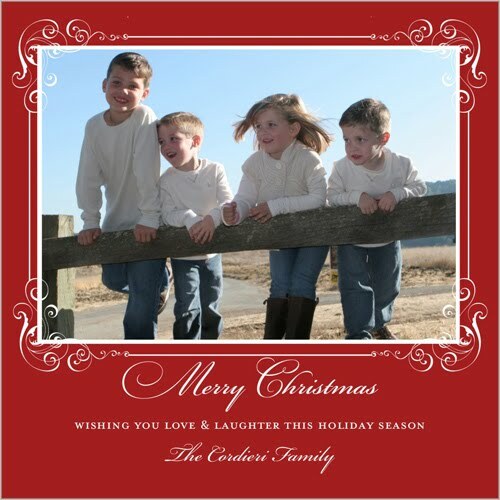 I received a holiday photo card package as a thank you for participating in this series.